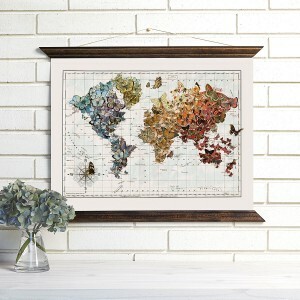 Bring vintage appeal, vibrant color, and whimsical design to your home with this gorgeous world map. Each region is populated with a flight of butterflies in blues, purples, yellows and reds across a soothing canvas of pale blue and white ocean. Printed with water-based inks on heavyweight recycled stock canvas, this free-hanging print is finished with a top and bottom frame and suspended with sturdy hanging twine. Made in the USA.